Success is all about teamwork – our customers and our team working together to get it right first time, every time. We have a number of layouts for you to choose from, but you can always supply a design for us to follow. Whether you want a 1 colour letterhead or full colour with your photo, we have a design for you. A5 4page personalised with your details on the inside and supplied with self seal envelopes – signature and corporate logos can be added at no extra cost. By having the choice of litho or digital printing, we can print as little as a few dozen copies to many thousands of copies. Add your name and other contact details to one of our House of Lords letterhead templates. 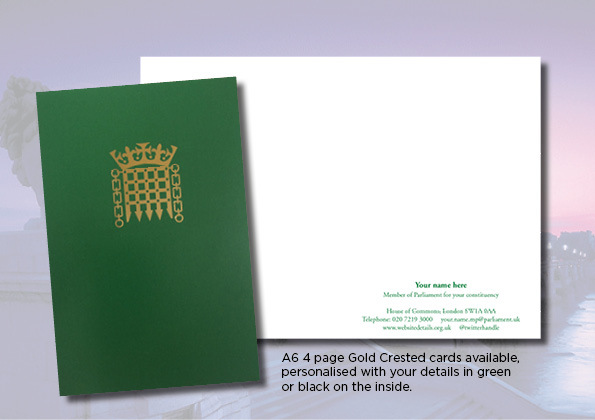 A6 4 page Gold Crested cards available, personalised with your details in green or black on the inside. We design and print everything from business cards to report & accounts and corporate brochures. Website need to work on tablets and smart phones these days and our websites do just that, starting at just £299. Whether you are a new business wanting everything from business cards and letterheads to a website or are established and need to promote your business with a corporate brochure or newsletter, then let us help you. Call us today.